Unions have urged the Justice Secretary to end the failed system of privatised probation contracts and bring them back into public ownership before there is ‘drastic and irreversible damage’ to the service. In a joint letter to David Gauke, the three unions representing staff in the probation service – UNISON, Napo and GMB – said the community rehabilitation company (CRC) contracts must be abandoned when they end next year. Earlier this month three of these contracts collapsed when the company operating them – Working Links – went into administration. The contracts and staff have been transferred to another operator Seetec. In their letter the unions say that the government ‘lost control’ of the services in Wales, Avon and Somerset, and Devon and Cornwall. They highlight that the government failed to keep promises and assurances made prior to privatisation that if problems occurred with contracts they would be brought back under public control. Ministers should have stepped in when it was clear the company was in trouble, say the three unions. The letter says during the tendering process “probation unions were reassured that the Ministry of Justice had appropriate contingency plans in place to step in if private contractors failed to provide services or hit key targets”. The letter then asks why “the remedial action plans, designed to cope with a collapse scenario such as the one which recently unfolded, were not put into operation in the South West and Wales”. A series of 21 CRCs was created in 2014 and the contracts for their management began the following year. These will finish in December 2020 to be replaced by 10 larger contracts. But Napo, UNISON and GMB said these plans should be dropped and all the contracts brought back into public ownership “before drastic and irreversible damage is done to the probation service”. – The letter has been signed by UNISON national officer Ben Priestley, Napo general secretary Ian Lawrence and GMB national officer George Georgiou. We are writing to raise our concerns over the government’s handling of the collapse of the Working Links community rehabilitation company (CRC) contracts last week and in particular the circumstances that led to your department allowing Working Links to file for insolvency rather than stepping in at a much earlier point to bring the obviously failing contracts back under public control. Dame Glenys Stacey’s HMIP report on Working Links, published last week, makes clear just how far the performance of the company had fallen. During the tendering of the CRC contracts in 2013/14, probation unions were reassured that the Ministry of Justice had appropriate contingency plans in place to step in if private contractors failed to provide services or hit key targets. The government retained a so-called ‘golden share’ in each CRC to ensure this was possible. Why then were the remedial action plans, designed to cope with a collapse scenario such as the one which recently unfolded, not put into operation in the South West and Wales? Your predecessor reassured us that persistent breaches by a CRC contractor would lead to termination of its contract and, that if a CRC failed under private ownership, it could simply be brought back into public ownership without the complexity of staff transfers. But, despite the failings of Working Links being well-trailed, your department has failed to step in and take control. Can you advise why there was no apparent attempt by MoJ at intervention prior to the contracts going into administration and why, in particular, the Working Links contracts were not terminated prior to their collapse? By allowing Working Links to declare insolvency, the government lost control of the delivery of probation services in Wales and the South West. We consider this has further damaged the credibility of the Ministry of Justice and has done nothing to reassure the public, service users or staff over the proposals outlined in ‘Strengthening Probation, Building Confidence’. We urge you again to rethink your proposals in ‘Strengthening Probation, Building Confidence’ and to take the opportunity to bring all the CRCs back into public ownership in December 2020. This would allow for a period of reflection before drastic and irreversible damage is done to the probation service. We are sure you agree that the current timetable to re-let the CRC contracts in December 2020 is not credible, hence the contingency plans being made to extend the existing CRC contracts, presumably at further great cost. 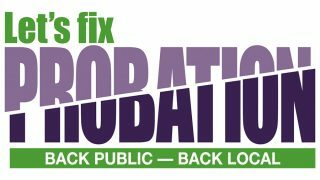 The unions are keen to work with you and your officials to re-set a positive direction for probation, but this will need all of the above to be taken into account.